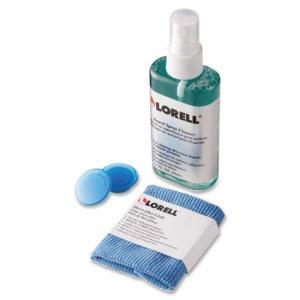 Dry-erase board cleaning kit helps maintain a clear surface for your meetings and notes. Nontoxic spray cleaner is gentle on hands while it removes shadows, ghosting and stubborn marks from dry-erase surfaces. Kit includes one 80 ml (2.7 oz.) bottle of spray cleaner, a microfiber cloth and two 3mm diameter magnets.